The event is supported by a major grant to the Keigwin School of Nursing from the U.S. Department of Health and Human Services for a program to advance education, graduation, employment and retention of qualified veterans seeking Bachelor of Science in Nursing degrees. 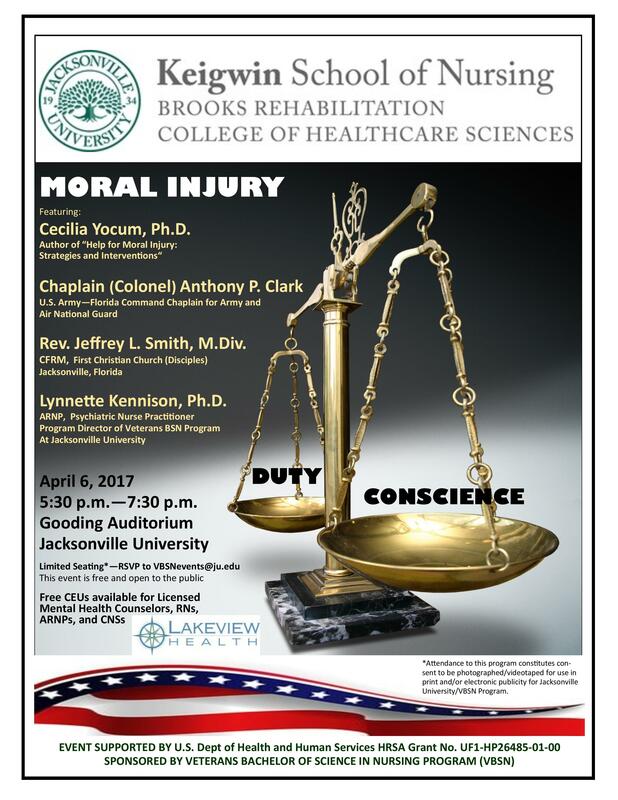 It is free to the JU community and public and will include continuing education credits for nurses and mental health counselors. 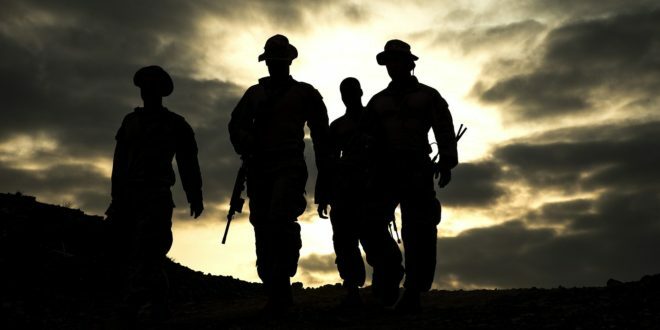 Author Cecilia Yocum, Ph.D., will give the participants an overview of some of the strategies and resources to address moral injury from a personal or therapist/pastoral perspective. Goals include rationally seeking to assess one’s own or others culpability, making or seeking amends, and compassionate forgiveness of self and others by understanding moral injury, and developing self-care and spiritual resources. Additional professional speakers include Chaplain (Colonel) Anthony P. Clark, U.S. Army – Florida Command Chaplain for Army and Air National Guard; Reverend Jeffrey L. Smith, M.Div., CFRM of the First Christian Church (Disciples); and Lynnette Kennison, Ph.D., ARNP, Psychiatric Nurse Practitioner, and Program Director of the Veterans BSN Program at the Keigwin School of Nursing/Brooks Rehabilitation College of Healthcare Sciences. 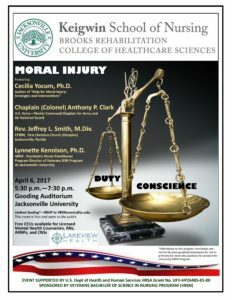 For more information, contact Camille Howard, (904) 256-8911, or check out the program at www.ju.edu/moralinjury.